A new study we’ve decided to call major has found that consuming hand-picked cherries improves mental health by shielding you from inconvenient facts. NOTE: This was just an April Fools' joke for 2018. A new study published today in the International Journal of Selective Science* found that consuming hand-picked cherries (HPCs) caused astounding improvements in mental health scores — over 9,000%! The study was funded by the Sugar Health Institute of Lucrative Learning (SHILL), a for-profit non-charitable organization committed to selling health products with the least scientific evidence. “SHILL was very interested in how HPCs could help improve mental wellbeing,” said SHILL’s CEO Dr. G. Gekko, “but we were more interested in how HPC sales could increase SHILL’s bottom line.” Dr. Gekko added that the results of this study will help inform SHILL about just how much they can overcharge for this product and which false marketing claims can be presented to a general audience without any context. This trial was a rigorous long-term study that lasted one hour and included a robust sample size of two people. Mental health status was assessed using the Favoring Assessments I Like (FAIL) questionnaire both before and after consuming 3,000 grams of HPCs. After ingesting the HPCs, each participant was shown undeniable evidence that disproved a false belief they held. Miraculously, the HPCs kicked in and caused short-term memory loss, shielding the participants from any information that could cause mental distress by challenging their pre-held beliefs. The subject’s exact whereabouts are still unknown. Since no adverse events were reported, the study was able to strongly conclude that HPCs do not cause any harm whatsoever. 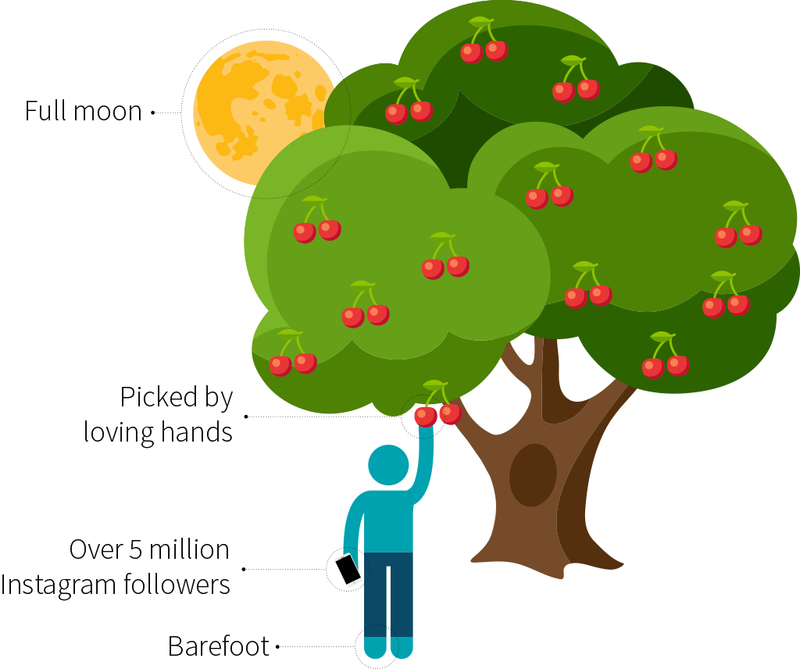 This study also uncovered a fatal flaw in previous HPC research that had shown no beneficial effects: the cherries must be picked in full moonlight by the loving hands of a barefoot diet guru with over 5 million Instagram followers. It is still not known if the cherries would be as potent if picked while wearing hand-crafted hemp sandals or if the guru only had a paltry 4.9 million Instagram followers. Future research will need to determine if the overuse of hashtags can offset the negative effects of having too few followers. When asked when the full text of the study would be available, the authors just laughed, explaining they would only be releasing the abstract since no one reads the full paper anyway. SHILL has concluded that no more research is needed, since the study yielded favorable results. HPCs are now available for purchase under the brand name FactShield™. ** The recommended dose is 3,000 grams of HPCs every hour. For maximum benefit (to SHILL’s bank account), HPCs should be paired with Re-Brain™, POWERbiotics™, and Adamantium Bone Broth™. If you’re ready for the wondrous effects of HPCs, click here to get onto the presale list! *The International Journal of Selective Science is a proud member of the Predatory Journal Network. **You will not be sold HPCs until signing a consent form you aren’t allowed to read. SHILL provided sole funding for this study, told the authors how to design it, interfered with the data analysis, wrote the manuscript, and paid off Reviewer 1. Reviewer 2 threatened to report SHILL to the ethics board and has not been seen or heard from since. The authors declare that there are no conflicts since the study results aligned with their interests. Clinicaltrials.gov Identifier: This study was not preregistered as this would have made selective reporting and data manipulation more difficult.